The Molten ® Libertria 5000 3x3 Basketball features remarkable grip and superior durability, with its wear-resistant covering, the Libertria 5000 3x3 is able to withstand the wear and tear of intense play on harsh outdoor courts without sacrificing grip and maneuverability. The new FIBA 3x3 standards require a different colour scheme, size and weight than indoor basketball. The maneuverability of a size 6 basketball has been combined with the weight of a size 7 basketball; the integration of the smaller size and increased weight allows for dynamic play and reduced wind interference when playing outdoors. To increase visibility, the ball features yellow and blue panels with orange seams. All 3x3 games will be played with a ball of the above standards regardless of age and gender. 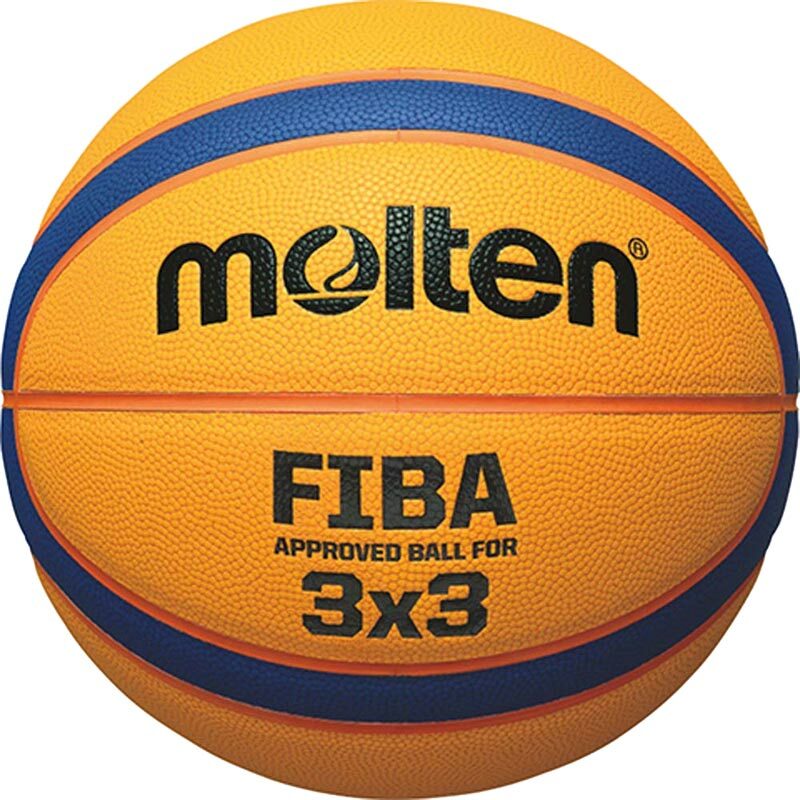 The Molten Libertria 500 3x3 game ball is FIBA approved and conforms to FIBA's new standards. Size of a size 6 ball with the weight of a size 7 ball. Basketball sizes vary by age, gender, and level of play. The official size of the basketball used by the NBA is 29.5 inches (size 7) in circumference. That's the same size used throughout men's college and high school basketball leagues. The WNBA uses a slightly smaller ball, measuring 28.5 (size 6) inches in circumference. For international play, specifically FIBA, the basketball used is what's called a Molten GL7 for men and Molten GL6 for women. These basketballs typically feature two different colours and are slightly bigger, with a 30.7-inch circumference for the men's ball and a 29-inch circumference for the women's. Boys in middle school (or ages 12-14), use a 28.5-inch ball (size 6), as do all women and girls ages 12 and up. For anyone, male or female, between the ages of nine and 11, a ball size of 27.5 (size 5) inches in circumference is recommended and is the most commonly sized ball used in youth basketball leagues. Boys and girls between the ages of 4 and 8 use a basketball between the sizes of 22 inches and 24.5 inches in circumference, depending on the individual's hand size, which can be determined by a coach or parent by measuring from the bottom of the individual's palm to the tip of his or her middle finger. An NBA basketball must be inflated to a pressure of 7.5 to 8.5 PSI. The WNBA uses the same pressure regulations. In the NCAA, inflation requirements are given in weight, with the men's ball having a maximum weight of 22 ounces and the women's ball having a maximum weight of 20 ounces. In FIBA play, the official rules state that the ball "be inflated to an air pressure such that, when it is dropped onto the playing floor from a height of approximately 1,800 mm measured from the bottom of the ball, it will rebound to a height of between 1,200 mm and 1,400 mm, measured to the top of the ball." Size 3: Mini Basketball and Key Stage 1, 5-7 year olds; circumference 56-57cm. Size 5: Key Stage 2, 7-11 year olds; circumference 69-71cm/27.5inches. Size 6: For both male and female players aged 11-14 years; circumference 72-74cm/28.5inches. Size 6: For female players aged 14+; circumference 72-74cm/28.5 inches. Size 7: For male players aged 14+; circumference 75-76cm/29.5inches.